Many folks in Milford have questions about the proposed Chapter 40B rental housing facility called Robsham Village. If approved, the 300-unit apartment complex would be built at 462-466 East Main Street (Route 16) in Milford. The following information has been compiled to help answer some of those questions. PUBLIC HEARING: The Zoning Board of Appeals will conduct a Public Hearing on the petition on December 6 in Upper Town Hall at 7:00 pm. • What Is Chapter 40B? • What Is Milford’s Current Level of Affordable Housing? At our September 21, 2016 quarterly public meeting, Citizens for Milford invited residents to attend and participate in a discussion aimed at understanding the Chapter 40B law; how state officials, a host community, and a developer work together throughout the process; and the potential positive and negative impacts a 40B development might have on our community. Citizens for Milford invited the residents attending the meeting to share their concerns and questions, which we then forwarded to Town Counsel Gerald Moody for a response. We extend our sincerest appreciation to Attorney Moody for his thorough and insightful explanations, which he provided in a timely manner. His answers to Milford residents’ questions are provided in the two memos linked below. The other files are supporting documents Attorney Moody included with the memos. Eden Management has received a Project Eligibility Letter from the Department of Housing and Community Development. MassHousing has determined that the project is “generally eligibile” but subject to final review of eligibility and anf final approval. The comprehensive permit application was submitted to Milford’s Zoning Board of Appeals in October 2017. Read it here. The Zoning Board of Appeals will conduct a Public Hearing on the petition on December 6th, 2017 in the Upper Town Hall, at the Milford Town Hall, 52 Main Street, Milford at 7:00 pm. The developer’s Project Eligibility and Site Approval Application to MassHousing includes all the details about the proposal, including project size; rental rates; location; site plans; financials; illustrations; and requested waivers from zoning, wetlands, and general bylaws. Click here to read the application. The total site is 116.9 acres. The current zoning for this property is Business Park. The developer, Eden Management, is applying using the state’s 40B law, which enables him to potentially bypass zoning bylaws as long as 20-25% of the apartments will be designated as affordable. The site has approximately 750 feet of frontage on Route 16/East Main Street, and 40 feet at the west end of Wildwood. The developer plans two multi-family buildings, both five stories high but less than 60 feet tall. The total number of apartment units to be built is 300. The development will include studio apartments, as well as 1, 2, and 3-bedroom units. This is not an age-restricted development. The monthly rental rate for a studio is listed as $1,094 for an affordable unit and $1,536 for a market rate unit. The monthly rental rate for a 3-bedroom apartment is listed as $1,573 for an affordable unit and $2,821 for a market rate unit. According to the Mass.gov website, “Chapter 40B is a state statute, which enables local Zoning Boards of Appeals to approve affordable housing developments under flexible rules if at least 20-25% of the units have long-term affordability restrictions. ” The goal of Chapter 40B is to increase affordable housing in areas where less than 10% of available housing is defined as affordable. Chapter 40B housing can be for rent or for sale, but the percentage of affordable units must be permanently maintained as affordable. Affordable housing is defined as a unit that could be purchased or rented by a household making up to 80% of the median income of the area. Learn more about the process in the “Chapter 40B Handbook for Zoning Boards of Appeal” published by the Massachusetts Housing Partnership. What Is Milford’s Current Level of Affordable Housing? According to the Department of Housing and Community Development, Milford’s current available housing inventory that meets affordability guidelines is 6.3%. To see how Milford compares with other towns in Massachusetts, click here. Milford Daily News: “Citizen group plans meeting; ZBA chairman advised to not attend by town counsel” 21 September 2016. Town Crier: “Buckley Blasts Water Company’s Saying It Can Supply a 300 Apartment Complex” page 15, 26 August 2016. Town Crier: “State Agency OKs 40B Site” page 13, 26 August 2016. Milford Daily News: “40B Site deemed eligible” 23 August 2016. Milford Daily News: “Broken main leaks 1.5 million gallons” 17 August 2016. Town Crier: “Town Officials Critique Proposed ’40B’ Project” page 15, 12 August 2016. Town Crier: “State Agency Conducts Site Visit of Proposed 40 B Location” page 9, 24 June 2016. Town Crier: “Apartment Complex Planned for East Main Street” page 17, 24 June 2016. Email Reply from Town Attorney Gerald Moody Answering Resident’s Questions About Robsham Village and Approval Process 16 June 2016. Milford Daily News: “Officials Walk 40 B Site.” 15 June 2016. Milford Daily News: “40 B Law Proposed on Casino Build Site” 3 June 2016. 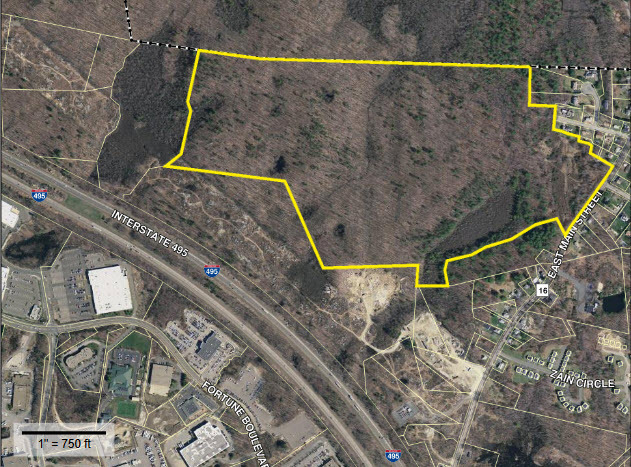 Milford Daily News: “Board Looks to Develop More Land. Town planners see a potential tax boon in ‘Little Vietnam,’ the rocky slope of undeveloped land between Rtes. 16 and 85, north of Interstate 495.” 26 January 2009.